SapioBlog: Half of the silver... is gone! 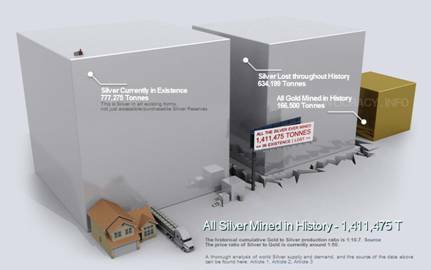 Believe it or not roughly half of all the silver mined in history has... vanished. The most romantic explanation, shipwrecks, are only a small part of the story. Most of the loss has to do with industrial processes: silver based compounds that are used in photography, catalysers and other applications. There is also the sad fact that a lot of silver may have been inadvertedly discarded or scrapped with larger batches of other metals – think an old ship component, that may include some silver decorations, the workers don’t pick this up, melt the lot and produce a beautiful park bench that is now 0.05% silver – and not a soul knows about it. The guys at demonocracy.com have a great couple of infographies on silver and gold that are worth the detour.